Do you have discoloured teeth? Did you know that Tetracycline antibiotic can cause long term permanent tooth discolouration? Tetracycline has been used in the past for curing a variety of illnesses however it discolours teeth permanently if it is given to children while the adult teeth are forming. If this occurs the teeth are discoloured usually with a brownish colour. 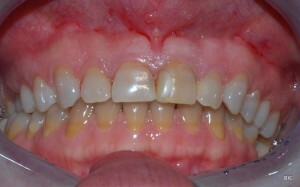 Unfortunately this type of staining is not always treatable with conventional tooth whitening techniques. Tooth whitening can be unpredictable and can not provide the necessary result for the patient and for this reason the treatment of choice is usually porcelain laminate veneers. Porcelain veneers are thin layers of porcelain which can be bonded carefully to teeth in order to correct the shade, shape and appearance. The treatment requires that a thin layer of the natural tooth be removed in order for the veneer to be bonded to.